This was a week of hands-on learning. It was one of those weeks where everything just "clicked". I'm thankful, because not all weeks are like that! I didn't snap any pictures of faces this week ~ I just noticed that! I think this is because I took pictures of what the children were DOING. If you missed the Top Ten Tips for Homeschoolers, be sure to read the post and leave your advice for my friend who is beginning her homeschool journey. 1. Working with Math U See blocks - we are really taking a step back with math and reviewing a lot of things before moving on to harder concepts. I think Math U See is going to be a great fit for us... and if you keep watching the blog you'll be excited by a Math U See opportunity I have for YOU. 2. My current read: Fall of Giants is historical epic fiction and I am LOVING it! It's interesting to learn a lot more about WWI through a riveting story. The book is 1,000 pages and I'm about half way through - I'm trying to make time each day to read while the kids read quietly, too. 3. Our Chinese bowls - we learned about lacquer and how it was popular in China, Japan and Korea. We used air dry clay, painted the bowls with acrylic paint, and added cherry blossoms and Chinese characters with a gold paint pen. We then made a mixture of white glue and water for the lacquer effect. Story of The World gives excellent activity suggestions! It wins the award for Favorite Resource This Week! 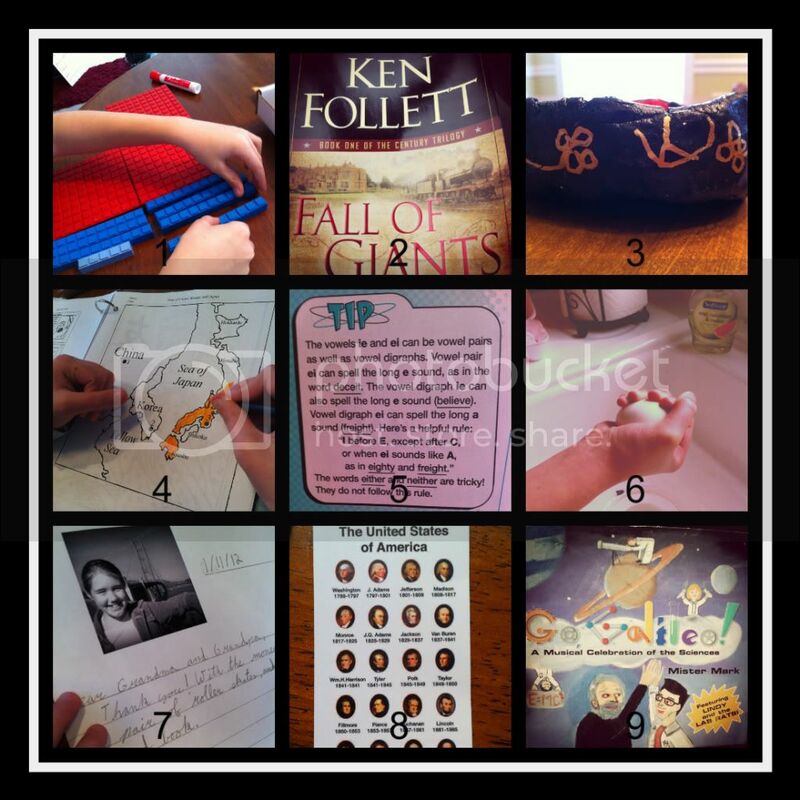 I pull so many read-alouds, activities, and recipes from the activity guide. Without it I would be lost! 4. More Story of the World activities - this time mapping - with a brand new set of water color pencils. These made mapping SO MUCH FUN! 5. It was a particularly challenging spelling week for Miss B - the IE and EI combinations are tricky, but after typing the words, copying the words, and making colorful flashcards with the words, they have finally been mastered. Spelling Workout is an excellent curriculum. 6. We completed Chapter 6 of Flying Creatures of the Fifth Day... all about mating and eggs/hatching. We did several experiments with eggs - all taken from Steve Spangler. This one (pictured above) was pretty cool, because no matter how hard we squeezed the egg, as long as the pressure was distributed evenly it didn't crack! Miss B used the iPad to complete the notebooking pages. I love how her research skills are developing this year. 7. Lots of letter writing was done this week - did you read my post about it? 8. Miss B is memorizing all of the US Presidents and the Preamble to the Constitution. Her Constitution class at co-op starts next Thursday. I've heard wonderful things about the class - all of the children will become Patriot Pals over the next 10 weeks! 9. We made use of time in the car to listen to one of our favorite CDs (that just happens to be performed and written by a good friend of mine from college - Mister Mark!). His CDs are funny and informative. Gman was running around the house singing "Go Galileo" tonight! Read alouds: The Chocolate Touch, The Phantom Tollbooth, Half MagicMemory Work each morning at breakfast: Bible verse box, US Presidents, Preamble to the ConstitutionLots and lots of piano practice!Lots and lots of roller skating! Please feel free to link up a collage of your week below. 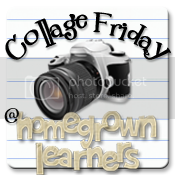 If you do, be sure to but the Collage Friday button somewhere in your post, or on your sidebar, and please visit the person who linked up ahead of you and leave them a comment. We all put so much into our weeks with our children - it's nice to get feedback! ~ Happily linking with Susan for Favorite Resource This Week, Kris for The Weekly Wrap-Up, and Dawn for Camera Phone Friday.